My mom’s birthday is coming up next month and I’m in charge of the food for the family dinner party. Of course I want to make something extra special to celebrate so I’m planning on making the theme something fun and unique…and a little wild (just like mom!). 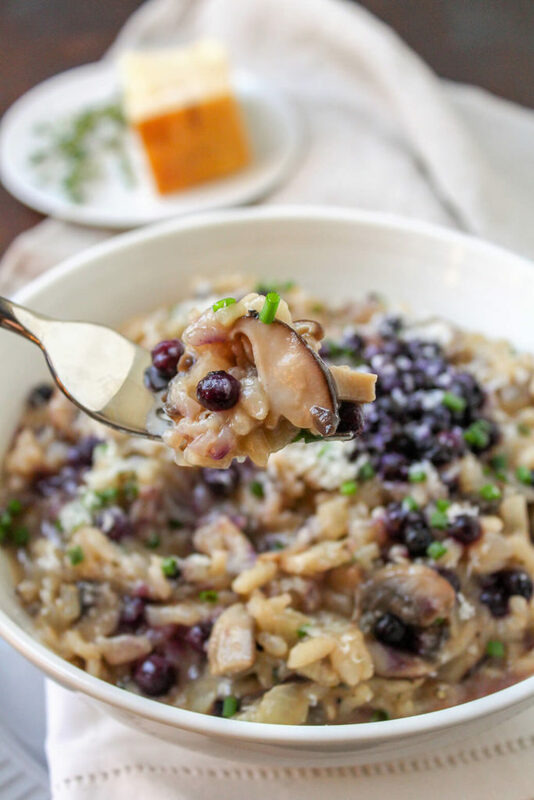 The star of the meal will be this Wild Blueberry and Mushroom Risotto. 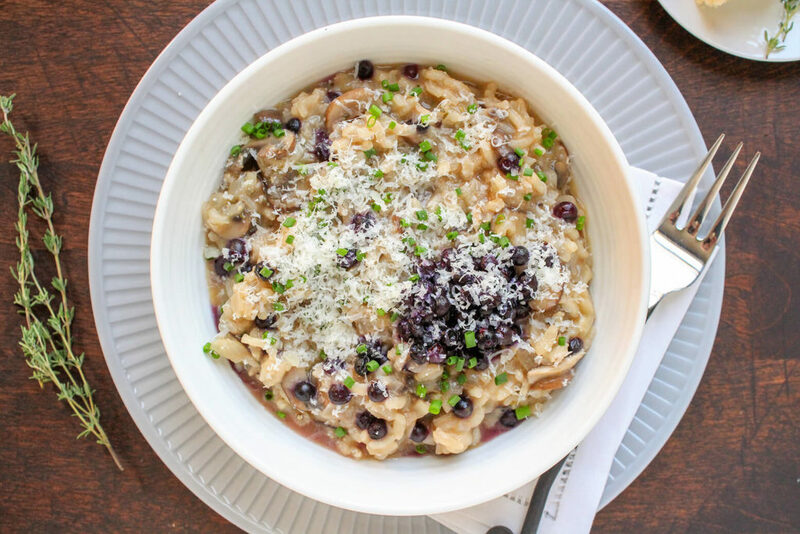 Risotto is an Italian favorite and I loved adding a pop of Wild Blueberry fruitiness to break up this heavy dish. I’ve done this before so I know the sweet-savory combo works out really well, and Risotto is the perfect comfort food dish for the fall! 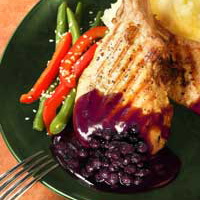 This tasty dish also doubles as a celebration recipe for Wild Foods Day on October 28th. For me, the term “wild” always conjures up gorgeous purple fields of Wild Blueberries, but nature offers us many other Wild foods, as well. From greens to grasses to mushrooms – wild foods are all around us. And because many wild foods survive in harsh conditions and are able to protect themselves against environmental stressors, they’re very potent in antioxidant nutrients. For my Wild Blueberry Risotto I used a mix of wild mushrooms I found at Whole Foods. Cremini, shiitake, oyster, and chanterelle mushrooms are so fun to incorporate into recipes because they’re typically found in unique places around the country – like along the mountain slopes and coastal areas. 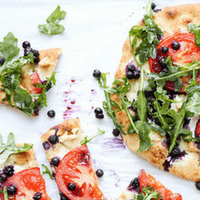 Did you know that oyster mushrooms typically grow on logs or dying trees in subtropical forests and that Wild Blueberries have twice the antioxidant content of cultivated blueberries? It’s true. Wild Blueberries also have more antioxidant power than many other fruits and veggies! 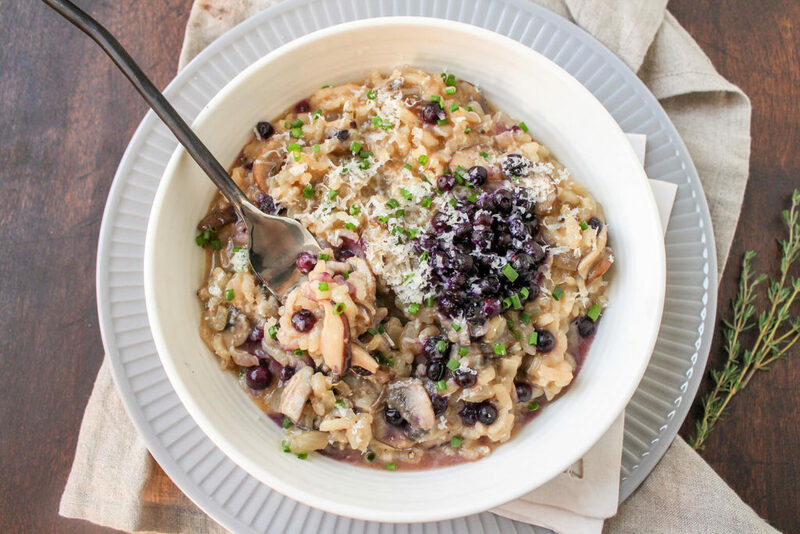 If you can’t find an assortment of fresh wild mushrooms at the grocery store, but still want to make this creamy and delicious risotto, just swap out the 2 1/2 cups of assorted fresh wild mushrooms for 1 1/2 cups of cremini or baby bellas, plus 1 cup of rehydrated dried wild mushrooms. To rehydrate the mushrooms, just soak them in hot water for 20 minutes and then use the soaking liquid in place of part of the vegetable broth. I prefer the texture of fresh mushrooms vs rehydrated, but dried wild mushrooms are a great option to get this meal on the table!